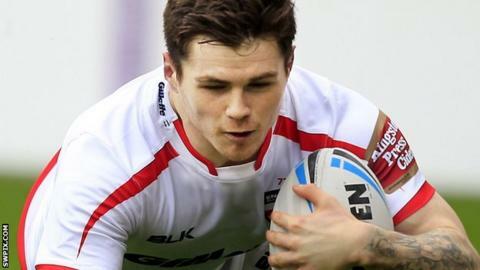 John Bateman, playing in the centres, got two tries in England's thrashing of France. England comprehensively thrashed a chastened France side 84-4 in their warm-up for the International Test series against New Zealand. While the Kiwis were given a competitive test by Leeds Rhinos in Friday's 34-16 friendly win, this was one-sided for Steve McNamara's side. There were 15 tries at Leigh, including a hat-trick for Huddersfield back-rower Brett Ferres. The impressive John Bateman was one of three players to score two. France managed a consolation score in the first period but were outclassed. Hull's KC Stadium hosts the opening Test against the world's number one side on Sunday, 1 November, before the game at London's Olympic Stadium on 7 November and Wigan's DW Stadium on 14 November. The hosts racked up a flurry of tries in a relentless opening 40, taking just two minutes for Kallum Watkins to go in, Josh Hodgson slipped over from dummy half and Bateman got the first of his double tries - before Olivier Arnaud took a pass out wide to get France on the board. It was a temporary reprieve as Liam Farrell scampered through a gap, and the excellent Bateman teed up Ryan Hall for a score on the left before crossing himself. The tempo was maintained after the break with a five-try surge in the opening 11 minutes, Tom Burgess and Brett Ferres scoring within a minute. James Roby picked up a double, George Williams chalked up a debut score and Ferres grabbed his double. Bateman and Hall again linked for the latter's score and Joe Burgess went in with quarter of an hour to play. Ferres' third brought up the 80-point mark and Widdop's kicking completed the rout. England: Hardaker; Burgess, Bateman, Watkins, Hall; Williams, Widdop; Hill, Hodgson, Graham, Farrell, Whitehead, O'Loughlin. Substitute: Roby, Cooper, Burgess, Ferres. France: Escare; Sigismeau, Baile, Jullien, Arnaud; Robin, Marginet; Bousquet, Boudebza, Maria, Larroyer, Perez, Simon. Substitute: Kriouache, Springer, Boyer, Goudemand. BBC TV coverage: First Test - Sunday 1 Nov, 16:30-19:00 GMT on BBC Two; Second Test - Saturday 7 Nov, 14:00-16:30 GMT on BBC One; Third Test - Saturday 14 Nov, 12:45-15:00 GMT on BBC One.